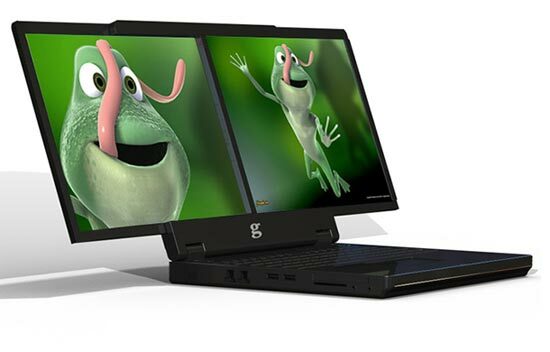 This certainly looks like an interesting notebook, the gScreen G400 with dual 15 inch LCD displays. The gScreen G400 features two 15.4 inch LED backlit displays, an Intel Core 2 Duo 2.8 GHz or 2.26 GHz processor, up to 8GB of RAM and up to 500GB of storage. Other specs include either an NVIDIA Quadro FX 2700m or NVIDIA GeForce 9800M GT graphics card, 6 USB 2.0 ports, VGA, Display Port, RJ-45, audio, firewire and a choice of either a 6 cell or 8 cell battery. The gScreen G400 is due to go on sale on the 25th of February, unfortunately there are no pricing details as yet, but it certainly looks like an interesting notebook, I wonder how much it will retail for.